The Parker 75 was named after Parker's 75th Anniversary Year (1963) and released in 1964 as a high end fountain pen that was a more modern alternative to the Parker 61 with some little innovations that would set it apart. The shell section was shaped and textured where a users fingers would grip the pen whilst the nib was a friction fit that could be turned around easily. A silver metal collar with engraved reference marks completed the set up, which was designed to allow the user to personalise their pen by setting the nib up to the angle that suited them best when holding the pen. Earlier pens pre 1970 had longer textured finger grips and a 0 reference on the nib collar as well as flat "Tassies" (the end piece at each end of the pen). Later pens lost the 0 reference and had indented tassies that were able to hold a small round disk with an initial printed on it as a way of further personalising the pen. Originally they were also sold with a nib adjuster tool so the owner could turn the nib without getting ink on their fingers. 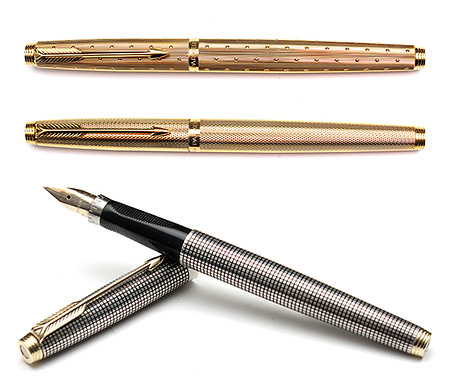 The pen was originally released in the sterling silver Cicelé (or Ciselle) pattern which consisted of a cross hatch grid of tiny squares engraved into the pen, supposedly inspired by the pattern on a cigarette case purchased from a London Jeweler, and set off with gold plated end pieces and a gold arrow. For a collector the defining characteristic of the Parker 75 is the shell grip with its three flattened finger grips, two of which are textured with a series of ribs, as well as the nib collar with the graduated markings engraved on it to go with the turnable nib. 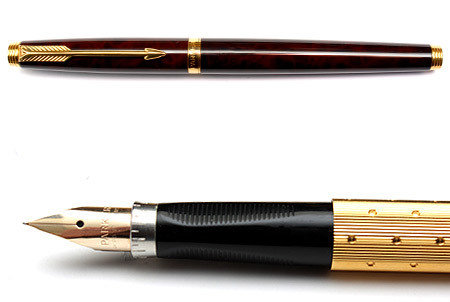 Some later French manufactured pens lacked the engraving on a gold nib collar. Other then the iconic silver Cicelé pattern the Parker 75 comes in a huge variety of colours and finishes as well as some limited editions such as the Spanish Treasure Fleet and the RMS Queen Elisabeth models. Common versions, other the sterling silver Cicelé, include the Lacque or lacquered pens where lacquer was painted on to a brass body to give a very smooth shiny finish as well as the French Place Vendôme series of textured gold or silver bodies. Rarer pens encompass a huge variety of colours, shapes and materials including solid 14k gold bodies, titanium bodies, one off prototypes and non-retail pens made for special occasions.